Many of us desire to be a good golfer. We want to step up to the tee and bomb a drive down the middle of the fairway 300 yards. If you golf, then you know that can be a difficult goal. If we don’t have the proper grip, correct alignment, and proper stance — it might just be a pipe dream. 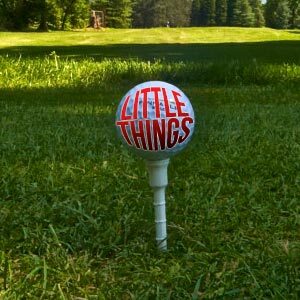 But if we don’t do the little things, the big project may not happen. By doing the little things at our job — and doing them well — we can make a lot happen. Not only does it help us individually to develop the right habits, it helps us to experience the little successes on a daily basis which adds to our confidence and our employer's confidence in us. Doing the little things in staffing might be taking that extra second to get to know the applicant a little better, allowing us to place them with the right employers. It might be making one last call that lands the new client. It might be taking one more interview to successfully fill a job for a client. The small efforts that are made on a daily basis will speak volumes in comparison to the one-hit wonders. In staffing we deal daily with people looking for jobs. They are looking for help to land a good position or job or potential career. That extra moment we take to make them feel important can be the difference in the quality and loyalty of employee. It can be the little difference that makes for a big, fulfilling life.